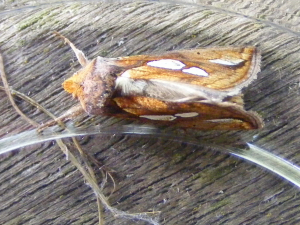 Observation - Gold Spot Moth - UK and Ireland. Description: The pictures do not do justice to this beautiful moth which has on overall metallic sheen and the spots look like someone has put on blobs of silver paint. This was caught in a moth trap using a low energy UV bulb (black light). The pictures do not do justice to this beautiful moth which has on overall metallic sheen and the spots look like someone has put on blobs of silver paint. This was caught in a moth trap using a low energy UV bulb (black light).